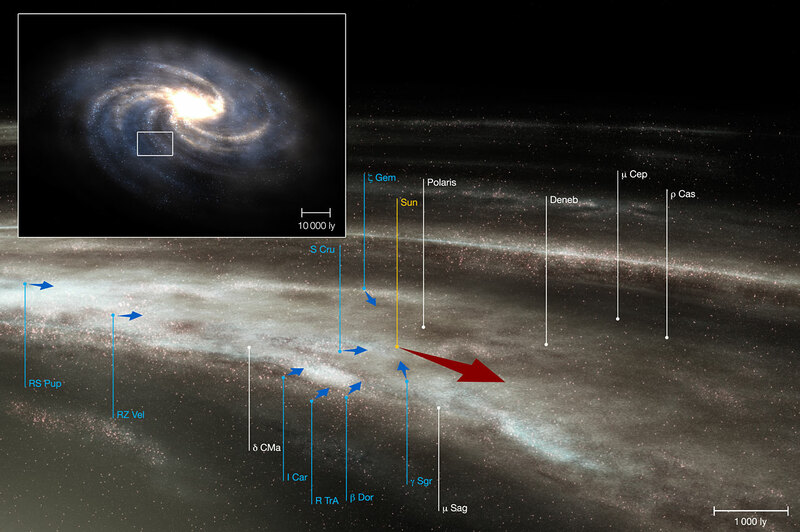 New, very precise measurements have shown that the rotation of the Milky Way is simpler than previously thought. A remarkable result from the most successful ESO instrument HARPS, shows that a much debated, apparent 'fall' of neighbourhood Cepheid stars towards our Sun stems from an intrinsic property of the Cepheids themselves. The result, obtained by a group of astrophysicists led by Nicolas Nardetto, will soon appear in the journal Astronomy & Astrophysics. Since Henrietta Leavitt's discovery of their unique properties in 1912, the class of bright, pulsating stars known as Cepheids has been used as a distance indicator. Combined with velocity measurements, the properties of Cepheids are also an extremely valuable tool in investigations of how our galaxy, the Milky Way, rotates. "The motion of Milky Way Cepheids is confusing and has led to disagreement among researchers," says Nardetto. "If the rotation of the Galaxy is taken into account, the Cepheids appear to 'fall' towards the Sun with a mean velocity of about 2 km/s." A debate has raged for decades as to whether this phenomenon was truly related to the actual motion of the Cepheids and, consequently, to a complicated rotating pattern of our galaxy, or if it was the result of effects within the atmospheres of the Cepheids. Nardetto and his colleagues observed eight Cepheids with the high precision HARPS spectrograph, attached to the 3.6-m ESO telescope at La Silla, 2400 m up in the mountains of the Chilean Atacama Desert. HARPS, or the High Accuracy Radial Velocity Planetary Searcher, is best known as a very successful planet hunter, but it can also be used to resolve other complicated cases, where its ability to determine radial velocities - the speed with which something is moving towards or away from us - with phenomenally high accuracy is invaluable. "Our observations show that this apparent motion towards us almost certainly stems from an intrinsic property of Cepheids," says Nardetto. The astronomers found that the deviations in the measured velocity of Cepheids were linked to the chemical elements in the atmospheres of the Cepheids considered. "This result, if generalised to all Cepheids, implies that the rotation of the Milky Way is simpler than previously thought, and is certainly symmetrical about an axis," concludes Nardetto. Nardetto, N., Stoekl, A., Bersier, D. & Barnes, T. G., "High resolution spectroscopy for Cepheids distance determination. III. A relation between γ-velocities and γ-asymmetries", to appear in Astronomy & Astrophysics. Nicolas Nardetto was at the Max-Planck-Institute for Radio Astronomy, Bonn, Germany, when doing this research.